The project progresses to enter constitutional lawyer Asanga Welikala’s domain and to entertain his DNA. This boyhood pal and long-time interlocutor of Hattotuwa’s is pressed into capturing in writing what he considers the crucial stages in Sri Lanka’s constitutional evolution. Along the way, the chums from the ‘school by the sea’ decide to limit their conceptual project to Sri Lanka’s republican phase, viz since 1972. There begins to emerge out of the rubble of postcolonial depression (1948-1971) the distinct form and shape of a republican constitutional process (1972-2015, and counting) that can be depicted in a series of drawings and constructed as a tangible edifice for public inspection and introspection. They co-opt an architect to lend more aesthetic artifice to this virtual edifice. Channa Daswatte steps in to visualise what his co-conspirators have been talking about. The trio spends long hours engaging with each other, exchanging dark thoughts and dark looks. Hattotuwa, understandably, wants our republican project gone wrong – and increasingly going wrong, in his book – to “look ugly” (my heart bleeds for him). Daswatte, an aesthete, can only “make nice” (as do we all desire our democracy to be and look). Welikala, a solider third leg of the stool, helps “keep real” (oh, for more of his ilk in the realm). In the end, this triad of curious re-interpreters of Sri Lanka’s republican project succeed in curating and presenting a unique exhibition in which the corridors (and corners and crannies and cupolas) of power are drawn and modelled for us the public of the republic to consider. As we do, we see the models get heavier and more cumbersome – ugly, despite the architect’s best intentions, or because of it. Ugly. Unwieldy. Unlikely to be able to stand for long. In the limit, as the curator’s introductory notes say: “The architectural output makes abundantly clear the failure of our constitutional vision...” Things fall apart. *How could we have countenanced this? *Why did we not oppose it more vigorously then, and/or why do we not engage it at all even now? *What were we thinking when we voted it in, and voted on it, or walked away from it in apathy or antipathy? 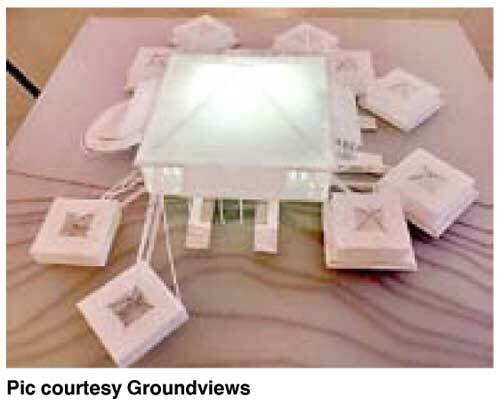 I see a simple, open, structure; the easily accessed ground floor of which is supposed to represent the legislature. After a closer look only do I notice that the executive branch of government also lies within it, with an upper storey to reflect the reality that the presidency rises, as it were, out of the House. The bulbous annexure that is the judiciary looks like a primitive rendition of a spacecraft in a Martians-are-invading movie. But attached to and yet separate from the main building, the courts complex is accessible by legislature, executive, and polity. Daswatte evidently wants this early experiment of ours with parliamentary republicanism to represent “a majoritarian government” that projects “a homogeneous style, except in the judiciary which is clearly manifest as different”. Welikala, on whose interpretation of the 1972 Constitution of the Republic of Sri Lanka this model rests, would add that “democratic majoritarianism has always to be balanced and countervailed by minority protection devices”. Ostensibly pleased with the establishment of the republican form of the state, Welikala is at pains to explain that since 1972, “the Sri Lankan state is a republic only in the formalistic sense of not having a monarchy at its head” – because, for him, “it is not a republic at all” (in the normative sense of ‘res publica’: this thing of all of us, the public), “but an ethnocracy in which the politically dominant ethnicity is constitutionally privileged”. Food for thought. In this model, the parliamentary base of the executive office has been encroached upon in an unmistakable way. The expansion of the presidential suite, so to speak, has brought many structural changes to the edifice of power. The executive is now so much larger than in the 1972 incarnation of the Constitution. It has access from outside the legislative framework, opening up power to parvenus. It overshadows the parliamentary part of the building. “The process of expansion also compromises the judiciary,” as Daswatte notes, “the roof of which requires some changes,” adding, “the access to the judiciary from the presidency is also made grander with a new staircase which partly hinders the direct access provided to the people” previously. Welikala adds to the discussion about “the adverse consequences of executive presidentialism from the perspectives of both democracy and pluralism” by reminding us of how “SOME presidents” (these lawyers!) have “further eroded the republican character of the polity”. He adduces the emergence of a “monarchical presidency” with the 1978 Constitution of the Democratic Socialist Republic of Sri Lankan, which has come to “dominate both institutional relations within Sri Lanka’s system of government, as well as the landscape of electoral politics more broadly”. The inability of our Second Republican Constitution to meaningfully address the grievances of the minority demographics in Sri Lanka led to the ‘power project’ undergoing drastic changes in terms of its ethos and appearance. Now, the model has mushroomed and sprung octopus-like appendages which appear to prop up the top-heavy building, giving the impression that the edifice would collapse without their support. And, as Daswatte observes, “the structures needed to hold these new elements in place – especially from above – are to be both highly over-designed for the purpose and also lends a clumsy appearance to the whole, whatever the efforts to make them appear a natural extension of the main structure”. Welikala attributes the addenda to the artifice of power-sharing to “Indian pressure and facilitation”, especially citing the Indo-Lanka Accord of 1987, whereby the island-nation was obligated to constitutionally devolve power in response for the demands of ethnic minorities for autonomy. He avers that “a new layer” was added to “the architecture of the state”, whereby while devolution brought in “representative institutions” to embrace minority demands or rights, “the overarching principle of the unitary state ... circumscribed the outer limits of provincial autonomy quite narrowly from the outset”. Hattotuwa is referring to a corrective to this, possibly, when he asserts that “centripetal tendencies in design must be eschewed in favour of centrifugal development”. On the exhibition’s opening night, Daswatte captured the ethos of this trajectory when he mentioned “centripetal” designs being privileged over “centrifugal” desires. Pithy. And pity. That “the full potential of the system has never been realised – not only because of the central state’s constant efforts to claw back powers, but also because of the disinterest [N.B. he may mean a negative “lack of interest”, not disinterest – which is neutral] among Tamil nationalists in the system as being ‘too little, too late’” (Welikala). I was quite taken aback at how the whole edifice of government had undergone a sea-change into something rich and strange. The artifice of the burgeoning executive presidency has now made the whole building quite ugly. The bulbous flying-saucer of the first branch of government now sits like a fat frog on top of a hideously bulging toadstool (Daswatte evidently having succumbed to Hattotuwa’s importuning to show how ugly the executive presidency had become!). The constitutionally manipulative expansion of the executive branch into a ‘hyper-presidency’ that dominates the look and feel of the building with its arms of power and control have come to overshadow the other two branches of government. It was shut away from the people, and in turn the powerful presidency shut out competing claims from legislature and judiciary of the need for power balance. Daswatte’s departure from a beautiful building ethic helped him to realise several undesirable lacunae and/or unbearable loads on the asymmetric super-structure. The presidency and executive offices are isolated; “the legislature and the judiciary are overwhelmed by the new structures”; “access to the supreme space of the judiciary is made easy from the executive” – the expansion into the former space damaging the latter; “extreme strain is placed on the legislature” – the “additional weight” of a obese executive rendering the House “completely unrecognisable”. In the five years between the 18th and the 19th Amendments, dear reader, we were frog-marched along these dark and dreary and dreadfully depressing corridors. But, with Welikala (per his enthusiasm on the exhibition’s opening-night) we have reason to rejoice. That in the relatively short span of five years, we the people – supreme, sovereign , surely the architects of a grander design than even the captivating models on display at this exhibition – sent the executive ‘home’ and relegated power to the ‘House’. On to the last exhibit. A thing of beauty is a joy forever! Be our two Republican Constitutions as they may – conceptually fragile, theoretically facile, spiritually failed – “the January 2015 presidential election saw the victory of the common opposition on a platform that had constitutional reform, and in particular the reform or abolition of the executive presidency, as its centrepiece” (Welikala). But only if it could last... this euphoria, this sense of other-Eden-ness. To paraphrase Hattotuwa, the master spirit behind this mind-bending show: *how can we be the architects of the change we want to see? *what is it about being part of the public process of discerning, deconstructing, and developing a new constitutional framework that comprises “the essence of citizenship”? *is it possible – even permissible – for our newly conscientised polity (or parts thereof) to seek and strive to give to “a constitution worth having, worth knowing, worth defending”? There is – in both art and life, in architecture as the science of the probable and politics as the art of the possible – such a thing as a grand design, a master plan, an overarching vision. But whose? Why is now best? What next? Where will it all end, this inertia around and momentum within the movement towards Sri Lanka’s ‘Third Republican Constitution’? We are neither naïve nor blasé. Nor are we, not too much unlike aesthetes, willing to be caught up – if not entirely raptured – by the beatific vision: “The drawings begin to suggest what the new scenario could look like, but because the fundamental flaws still remain, the suggestion may be to strip the structure down to basics and start again by addressing the ground conditions. But even here, instead of the expensive underpinning of the existing structures, it may be more viable to demolish and build anew a structure that addresses all the issues” (Daswatte). The more balanced view short of moulding and shaping a new Constitution comes from Welikala: “The Nineteenth Amendment establishes both a better structural balance between the executive and the legislature, and a substantial framework for depoliticisation. It will have to be seen how well it is implemented.” There is no denying, however, that there’s more to all this than meets the eye, and has been revealed in and through this exhibition. In public spaces and private meetings. In election manifestoes, pre-polls propaganda, and post-mandate spinmeistership. A move is afoot. A leitmotif is emerging. Hitherto hidden agendas and unseen players, little known at large but well recognised and acknowledged in cameo and in camera, have come out to share their ideals, their values, their vision. Why, at this very exhibition, UNP MP Jayampathy Wickramaratne – the putative architect of the ‘Third Republican Constitution’ – surfaced briefly from reclusive obscurity to present a case for our new ‘bill of rights’, as it were. Given the recent – and, if we’re honest, customarily hidebound – nature and ethos of Good Governance, let us hope it is not too little, too late. Or too much, too soon? The UNFFGG-led coalition government would do well to get its act together vis-à-vis communicating its vision to the public. Not hiding its light under a bushel, shying away from engaging the public as stakeholders in the process. That’s what being a republic is all about – or would, should, and could be. Irony: if the Third Republican Constitution would bypass the polity at large and pitch its brief to its elites alone – the likes of whom went to the welcome forum of this groundbreaking exhibition. Today, Tuesday 22 September, is the last day of <Corridors of Power: Drawing and Modelling Sri Lanka’s Tryst with Democracy>. JDA Perera Gallery: 46, Horton Place, Colombo 7.